MACOMB, IL -- Looking for the pawfect stocking stuffer? 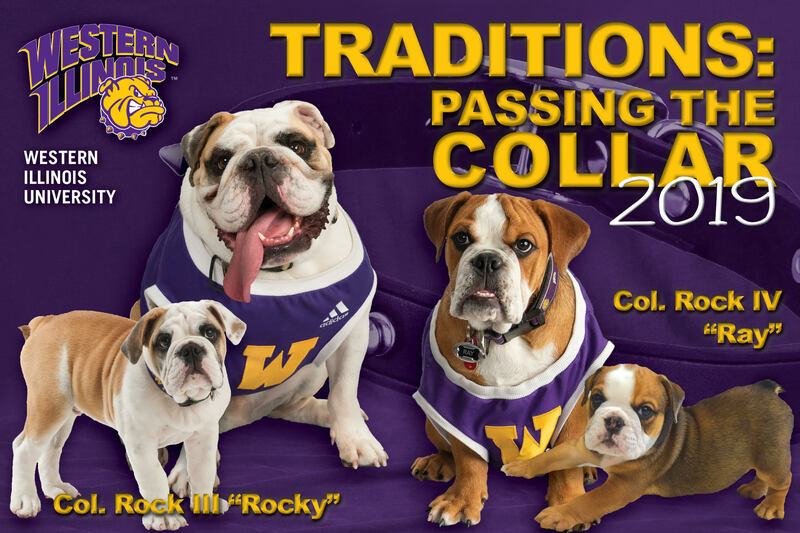 Check out the 2019 Western Illinois University "Traditions: Passing of the Collar" Col. Rock III and Col. Rock IV (aka Rocky and Ray) calendar. The 2019 calendar, designed by University Relations Graphic Designer Shanee Sullivan, features photos -- taken by WIU Visual Production Center photographers and by Rocky's "people" Joe Roselieb and Ketra Russell -- of Western's beloved recently retired canine Rocky and WIU's new mascot, the adorable 10-month-old Ray, along with important WIU dates, such as Founders' Day, Homecoming and Purple & Gold Day. The calendar is on sale now at the University Bookstore for $5.50 and is also available for purchase online at https://bit.ly/2BOwO9j. A portion of the proceeds from calendar sales go toward the Col. Rock Fund, established by the WIU Foundation in February 2012, which helps provide financial support for the live mascot program. A signing event, with Rocky and Ray both present, will be held from 12:30-1:30 p.m. Wednesday, Nov. 5 in the Bookstore. Rocky, who turned 8 on March 3, retired in Summer 2018. He joined the WIU family in May 2010 as a 10-week-old puppy. Roselieb, a WIU alumnus and director of residential and auxiliary facilities at Western, along with Ketra Russell, director of auxiliary finances/contracts, are Rocky's and Ray's caretakers, trainers and chauffeurs. Col. Rock IV -- aka Ray, after WIU's legendary longtime coach and athletic director Ray "Rock" Hanson -- arrived in Macomb in mid-June. The AKC-certified English bulldogs were donated to Western by Richard and Beth Siess of the Siess Ranch in Seneca, KS. Dr. Karen Blakeley of Macomb's All Pets Veterinary Clinic and the WIU School of Agriculture, along with other University and community organizations and individuals, make sure the mascot's needs are well taken care of. To follow Col. Rock III and IV on Facebook, facebook.com/Col.RockMascot.